Greetings, readers! You may be wondering why you’re seeing this recap now when the race was all the way back in August. Unfortunately, your friendly neighborhood recreational OCR athlete has been dealing with some difficult family stuff and off the grid for a while. Thanks for understanding. The race was held on Saturday, August 4 at Maple Grove Raceway in Mohnton, Pennsylvania. I raced with my twin sister Patti and friends Chris and Chris. While the guys and I did Rugged last year, it was Patti’s first time. 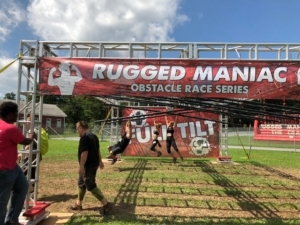 For all of us, it was our first experience with the Rugged Maniac X format. For those not familiar with the area, the venue was approximately 55 miles from our meeting point in Center City Philadelphia. We had a 9:20 am start and arrived around 8:00 am. Parking was right at the venue and cost $15 per car (cash only) with a short wait. It’s $10 if you pay online in advance. We got through registration quickly with no issues. 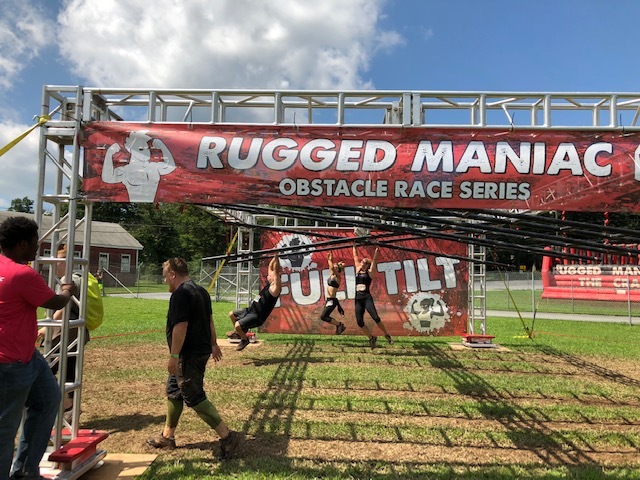 Rugged X isn’t timed, but along with our bibs, we received special “Rugged Maniac X” headbands you could wear on the course along with plastic yellow wristbands showing we were Rugged X racers. Both bag check and spectators were free. I would be remiss if I didn’t mention the restroom facilities; the porta-potties were plentiful and clean and relatively easy to find in the festival area. There were also plenty of places for spectators and racers to sit near the main stage. Once we were in the starting corral the MC gave us an encouraging speech along with some jokes and sent us off. The weather was decent with the sun coming out later in the morning. As I mentioned, it was our first time racing this format but we generally knew what to expect. The course was about a 5k distance with 3 water stops and 25 obstacles spread throughout. 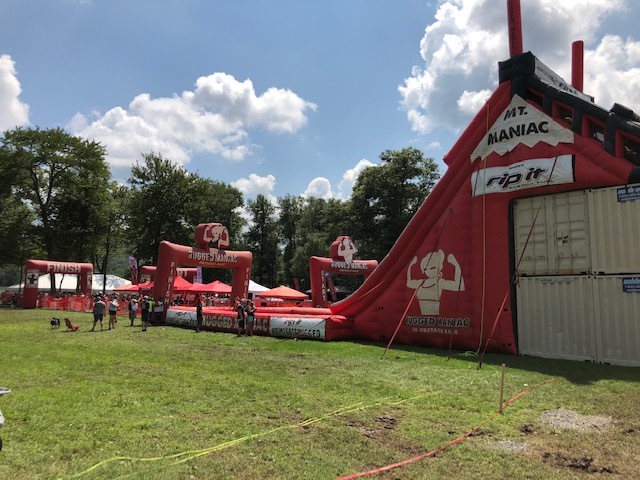 Because the venue is a racetrack, quite a bit of the course was on asphalt but there were also plenty of wooded areas that were muddy and had natural water crossings. It had rained the day before and one water crossing was significantly higher than usual to the point where a volunteer was dispatched to the area for safety reasons (or at least to forewarn us!) 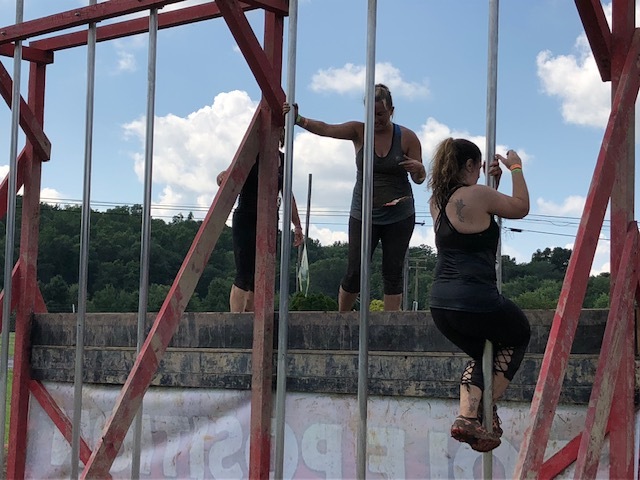 For some reason the obstacle Fenced In wasn’t made available for our race. It looked like it had been set up but ultimately removed. We guessed it had something to do with the rain. We also got to try several of Rugged’s new obstacles, including Off the Rails, Full Tilt and Pedal for the Medal. 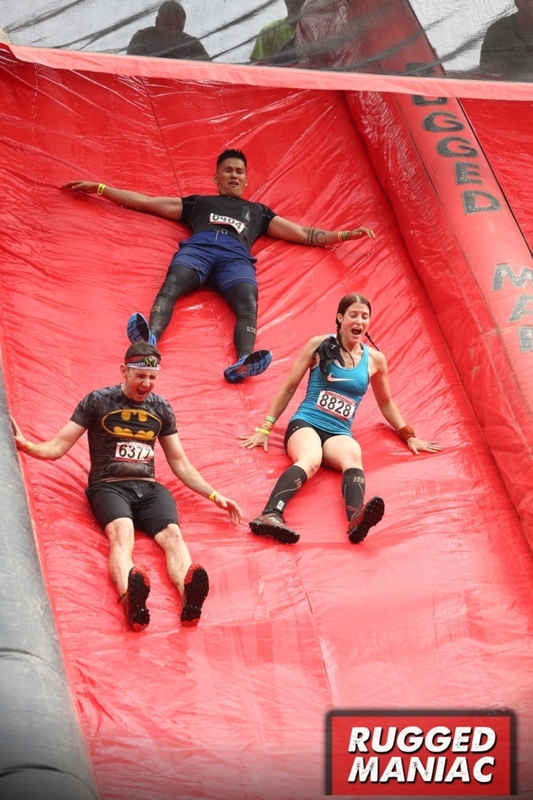 One of the rules of Rugged X was that if you crossed the finish line your “experience” was complete. An issue with this was that the only way could access water at the end of your lap was on the OTHER SIDE of the finish line, otherwise, you had to start your next lap and wait for 1 mile for a water station. After our second lap, I finally asked the MC if I could cut through his booth and grab a few bottles of water. It’s not a dealbreaker, but I’d suggest to Rugged that they add another water station inside the finish area for Rugged X racers. 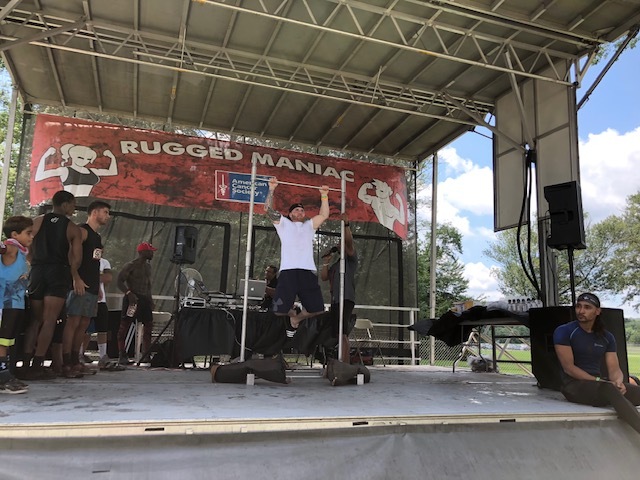 As advertised, the festival really is like a big party, with a mechanical bull, music and dancing, along with competitions such as a pull-up contest and beer stein holding. There were numerous vendor tents and Maple Grove Raceway itself was selling food including, burgers, hot dogs, pulled pork sandwiches and fries. 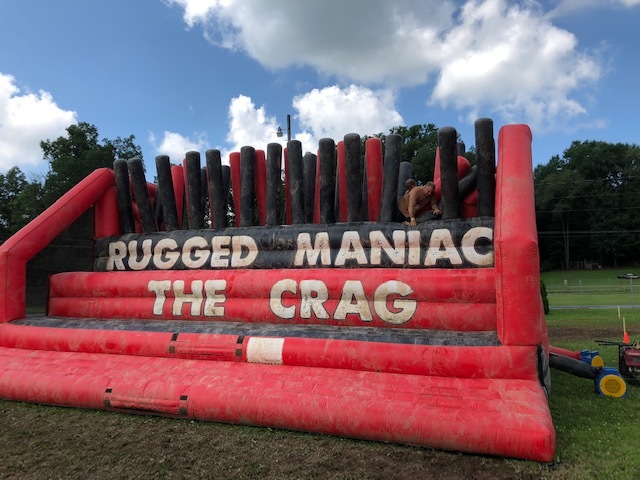 You could see the final obstacle Mount Maniac from the festival. Finishers received a medal and t-shirt. There’s no special or different medal for Rugged X finishers. You also get the usual free beer/banana/BODYARMOR drink. Photos are posted online for free download a few days after the race. Overall, we enjoyed this race. It was fun and the multi-lap format added a bit of challenge. The single lap option (regular Rugged Maniac) is a great introduction for someone new to OCR. What do you think about this race and new format? Let me know in the comments! I felt similar about the multi lap. Because I ran the 9 a.m. we did cross the finish line because the timing. And I was allowed to grab a water bottle and a snack but I hadn’t thought about an advance that I might want to Camelback for lap 3 or 4 in the future. I only did 2 laps that day so it wasn’t a huge problem but the fact that we can’t leave the race can be kind of frustrating when it comes to what gear to prep. Especially if your goal is to spend the day out there.